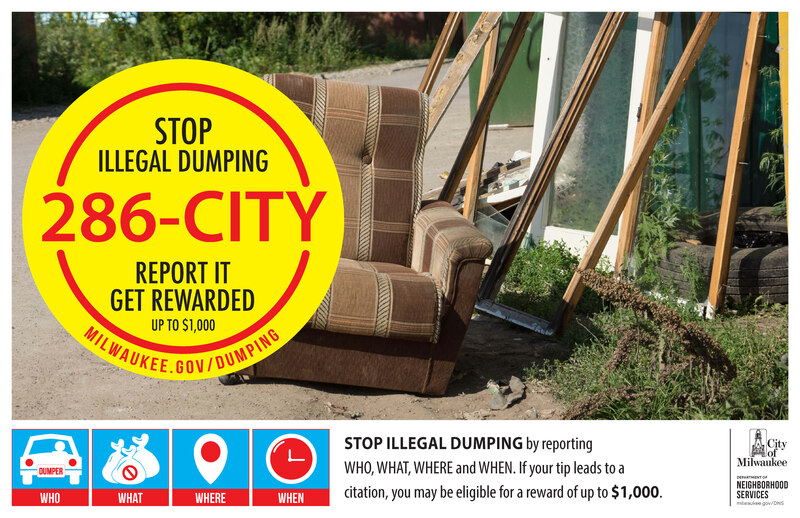 Stop illegal dumping by reporting WHO, WHAT, WHERE and WHEN. If you see illegal dumping in progress, please do not confront the individual(s). Write down the details and the description of the suspect(s), vehicle make and model, license plate, the items dumped, address/location, and the date and time of the incident. 1 cubic yard of bulky items (the size of a recliner) may be put at your regular collection point for pickup on your regular day. Place items at your collection point and then request a special pickup online or call 414-286-CITY (2489). Fee is $50 for 1-4 cubic yards and $150 for 4-6 cubic yards. Drop off bulky waste items at a Drop Off Disposal Center for NO CHARGE. You can also dispose of electronics, appliances, and tires for recycling. Items can be taken to a Drop Off Disposal Center for a limited fee or collected via a pre-paid request. Call 286-CITY (2489) for additional info and fees. MMSD offers Year-Round Drop-Off and Mobile Collections. Drop off old and unused household hazardous waste and help keep our land, and our water, a little cleaner. 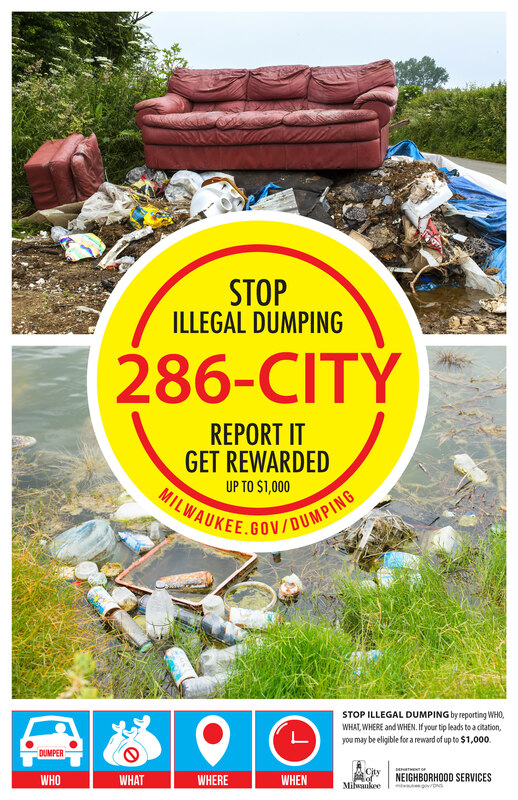 This campaign was created to raise awareness about illegal dumping issues in the city of Milwaukee. Follow DNS on Twitter and share the message using #StopIllegalDumpingMKE. Save money and reduce the amount of waste that ends up in the landfill with these resources below.